When your affiliate signs up to promote your products, you can choose to collect as little or as much information about them as you wish. W8-BEN/W9 forms – see this article. To select what information you want to collect from your affiliate simply head over to your affiliate area in your dashboard then go to the Product options tab and click the Edit sign up page button for the product you want to set up. This will open a modal window where you can enable the different information you want to collect from your affiliate. 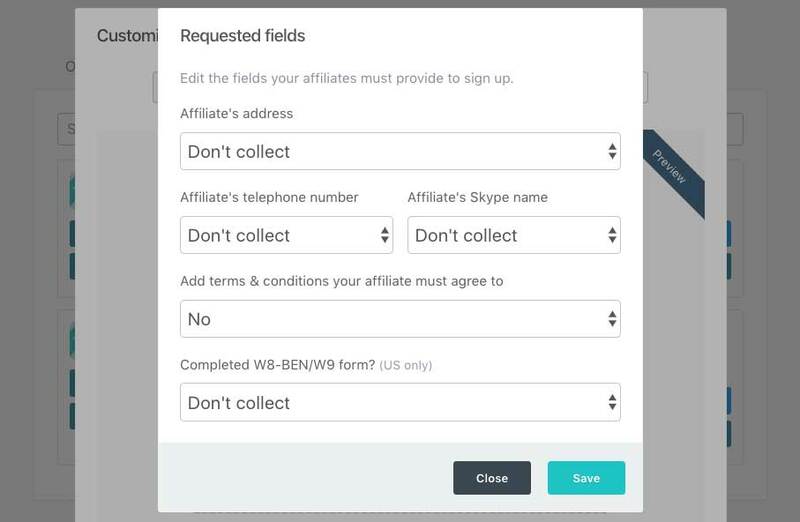 Once saved, your affiliate will be required to complete these fields when applying for your affiliate program. This information can then be viewed from their profile under your My affiliates tab.